A strong 4-Bow bimini cover from Oceansouth, this bimini cover is ideal for a range of larger boats including open boats, runabouts & centre consoles. 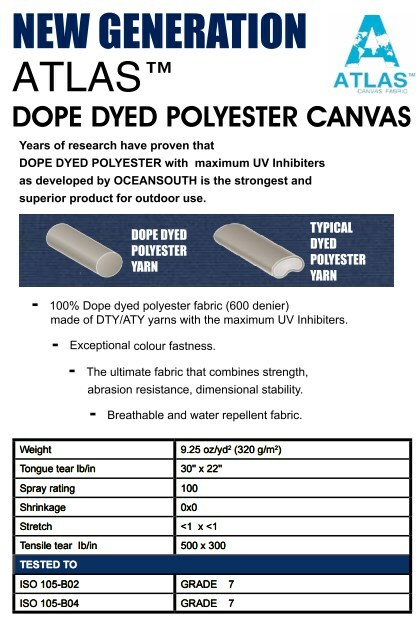 Manufactured from ATLAS™ dope-dyed polyester canvas fabric (600 denier) for strength and long-life under the Australian sun, containing maximum UV inhibitors. All Oceansouth biminis feature a unique integrated storage cover for protection while towing and when the cover is not in use. 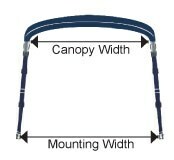 Additional bimini support poles are available separately. Available in five colours - blue, sand, black, maroon & grey. I honestly cannot fault the quality of the 4 Bow Bimini. 5 STARS! Great Quality, easy to set up and best of all quick and reliable delivery from Boat warehouse. Will definitely buy again and highly recommend! Ordered a 4 Bow Bimini online on a Monday Night and was delivered on Thursday morning. Excellent quality and extremely easy to install on my Quintrex Runabout. The order and delivery went very smoothly. The product was delivered in 48hrs. Brilliant for interstate. The product quality was better than I could imagine. Easy to assemble and install. I highly recommend The Boat Warehouse and would have no hesitation in promoting their services to anyone I know. Easy to fit sets up easy a great product. Happy with the Cover so far so good will see down the track how it pans out for fade and discolouration. The built in cover is a big plus not having to store a separate cover in back of the car or boat. 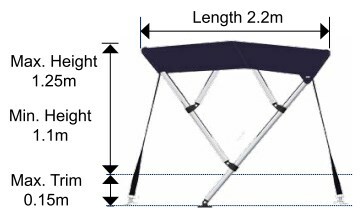 Click the button below to add the Bimini Cover - 4 Bow Aluminium to your wish list.